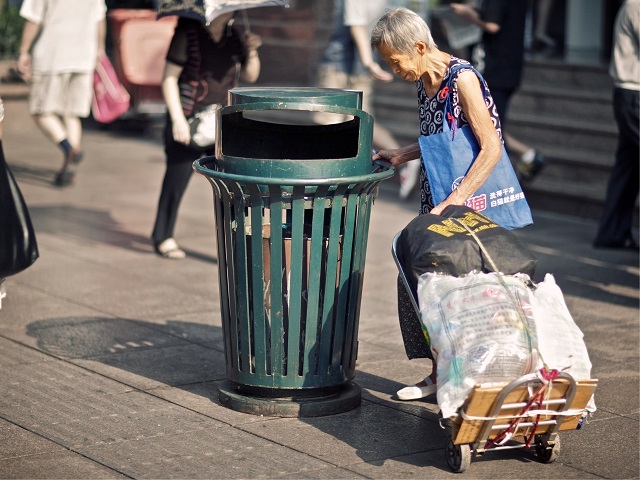 As China has developed and urbanized, waste management has become a critical issue for the country. Photo by Nelson Wu/Flickr. From air pollution to intense traffic congestion, China faces an array of environmental and resource challenges, many of which are a result of its urbanization and development over the past few decades. In Beijing—as across most of the country—concerns over unsafe drinking water have spurred many residents to turn to bottled water and other bottled beverages to ensure safety and quality, driving up the number of discarded plastic bottles. Without a municipal recycling system in place, migrant workers are often involved with recycling plastic bottles, selling them in bulk to recycling yards. However, a few innovators have recognized the economic opportunity in this field and have recently stepped in to help improve recycling in China’s cities. One of these innovators is the Incom Recycling Company a subsidiary of one of the largest plastic bottle manufacturers in Asia. In late 2012, Incom began installing “reverse vending machines” around Beijing. As of December 2015, there were over 2,200 machines in the city that had recycled around 18 million empty bottles. With its success to date, the company has plans to expand to other major cities in Guangdong, Shandong, Chongqing, and Shanxi in the coming years. The machines allow users to deposit plastic bottles in exchange for a small payment, a transit pass, or mobile phone credit, the value of which is based on the quality and quantity of bottles returned. When bottles are dropped into the machine, a sensor determines their size and shape and sorts accordingly; it also can send a signal to the company when the unit is full. Incom emphasizes that as a major manufacturer of plastic bottles, it focuses on recycling the bottles it collects into more plastic bottles (rather than toys or chemical products), which reduces the amount of resources coming into its manufacturing system. In fact, the company was originally conceived of as a means to source more bottles for the parent company to reuse. Before widespread deployment of the machines, Incom struggled to secure enough bottles due to competition with informal recyclers. Importantly, Incom’s strategy and development plans align well with the Chinese government’s increasing focus on leveraging the capabilities of technology to advance higher quality growth, encouraging innovation and entrepreneurship, and promoting a circular economy. These machines are able to provide real-time data on recycling behavior in any location they’re placed – data the can be used by the local government to better design and target future recycling and environmental initiatives. To more efficiently and safely tackle electronic waste (or e-waste), China’s internet giant Baidu teamed up with the UN Development Program to develop a smartphone app, Baidu Recycle, which connects users with certified e-waste recycling and disposal companies. The app aims to cut down on informal e-waste recycling, which can be hazardous for the environment as well for the health of those dismantling recycled items. The most recent version of the app (Baidu Recycle 2.0) covers large products such as TVs, washing machines, and refrigerators, as well as smaller ones like cell phones and laptops, and covers all major cities. For its innovation in promoting the newly adopted Sustainable Development Goals, the app was featured at the Global Solutions Summit on the sidelines of the UN Generally Assembly in September of last year. To connect with certified recyclers, users can take a picture of their obsolete electronic item and the app will identify the type of waste, provide an estimated redemption value for the user, and connect the user to a recycler that will set up a pick up time. Involving Baidu as a partner allows access to Baidu’s image recognition and search engine capabilities and also unlocks the possibility of leveraging big data to better promote environmentally friendly practices. While the above are two examples are among a growing number of innovative methods for a country facing increasing resource constraints, recycling ultimately tackles the back end of the system, rather than the source. It also further cements recycling as an activity driven by economic rewards rather than by a mentality of environmental protection. However, it’s important to note that green development and a circular economy are increasing priorities for the Chinese government as well as the public. The 13th Five Year Plan, the country’s overarching economic and social development plan to be released next month, will be a key document in illuminating the country’s next steps forward.